1. Boil the green beans in salted water for 5 minutes, or until just tender. Meanwhile, spoon 1 tbsp of the oil into a large bowl. Add the vinegar and anchovies. Season well. 2. Cool the green beans under running water for a few seconds, shake dry, then add to the dressing. Mix in the borlotti, some of the onion and the artichokes. Rub the tuna with 1 tsp oil, then season. 3. Heat a griddle or frying pan over a high heat, then sear the fish for 2-4 minutes on each side, until just cooked through. Leave to rest on a plate for 2 minutes, then slice thickly. Spoon the salad onto plates, leaving some dressing behind. Top the salad with the fish, then scatter over the remaining onion and anchovy dressing. 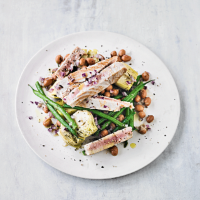 Cook’s tip If you’re not confident cooking fish, then a jar of Waitrose Albacore Tuna, either in oil or water, would be great with this salad too.